Jake Gyllenhaal manages to do his best Patrick Bateman impression and out-Bale Bale in one of his best performances to date. Dark, demented and very good. If a little predictable. So what’s it about? When Lou Bloom (Gyllenhaal), a driven man desperate for work, muscles into the world of L.A. crime journalism, he blurs the line between observer and participant to become the star of his own story. Within the opening sequence, we get the essence of Lou Bloom (Gyllenhaal) as he is caught stealing copper fencing from the train tracks. Flashing that Cheshire cat smile and pleading innocence, you can see the cogs turning. And in the bat of an eye, that smile fades instantly and a monster is unleashed. Cool, calm and collected. Striking when the moment arises. A true American psycho. A smooth talking charmer with ambitions that he will stop at nothing to achieve. An impressive and well written debut from Dan Gilroy. Fantastically shot. The cityscape at night was captured brilliantly by the cinematography of Robert Elswit. 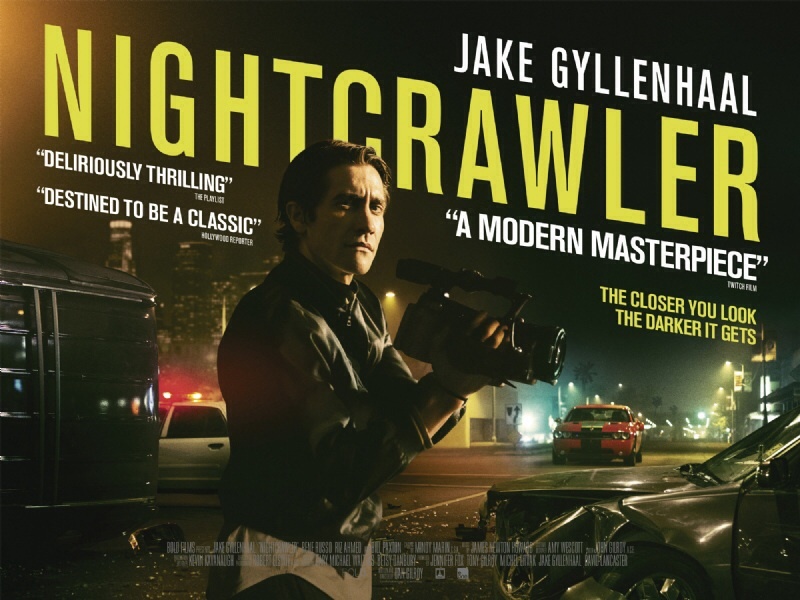 Nightcrawler is somewhat of a slow burner as we watch Bloom climb the social ladder for fame and glory. It starts with our sociopath desperately seeking a job and smooth talking his way into anything. That is until he witnesses a crash. Those flashing lights and ruthless nightcrawlers (Freelance cameramen preying the streets for horrific accidents, murders and crime scenes) creeping out from the urban underworld, craving for a pay check soon sets our protagonist on his path. Bill Paxton plays the relentless Joe Loder brilliantly and it’s good to see him back in movies. His character dispensing the mantra: “If it bleeds, it leads” unwittingly sets up a competition for carnage. Gilroy does make some fantastic commentary and satire on the censorship and attitude of the news media. The public’s obsession for blood and trauma constantly pushing them to distort moral and ethical boundaries for fifteen minutes of fame. The film builds up and up as the madness ascends to crazy and scarily realistic levels. Where Bloom first intervenes small car accidents with a little handheld camera; it soon escalates to breaking into live crime scenes and moving pieces of evidence (and even bodies) to make the perfect shot. It was great to see Riz Ahmed (Four Lions). He plays the clueless sidekick with aplomb. Oblivious to Bloom’s ambitions and unaware of what lay in store. Some of his encounters with Gylenhaal make for dark but comical viewing. Rene Russo also stood out as Nina Romina (Awful name. Didn’t realise that until I saw the credits). Questioning the morals behind Bloom’s actions but desperately enabling him for the sake of keeping her job and bringing in the ratings. SMALL BIT OF TRIVIA: Dan Gilroy is the husband of Rene Russo and brother of Tony Gilroy who is responsible for Michael Clayton and The Bourne franchise. The chase sequences are intense. Especially in the closing moments as Bloom’s descent into darkness reaches breaking point. There are suspenseful moments to be had. The sequence in which Bloom and his sidekick are filming the police attempting to apprehend a murder suspect. A scenario the pair set up. I was hooked. Nail biting stuff. Executed perfectly. The tension mounting as you wait for the fireworks to go off. At times, it did feel like the trailers did show too much of the film. You knew when to expect several of the bigger moments in the film. That’s not to say there aren’t more surprises along the way. Bloom is intelligent and some of his speeches rival Bateman. But crafty and calculated he may be, they go on far too long. Especially in his dinner date with Nina. We get it. You’re mad. Get on with it. One major qualm is that with a film like this; there are only ever two outcomes. It seemed to go down the Bad Lieutenant (Cage Lieutenant) route which makes for a surprisingly flat (if typical) and slightly abrupt ending. Don’t get me wrong. Gyllenhaal is a tour de force and should be commended. The weight loss added to his creepy demeanour and shark toothed grin. Gilroy has written and directed a visceral descent into the dark side of the American dream. Something we haven’t seen for a while. A resurgence? Maybe. As Lou Bloom says, “If you want the lottery, you have to make the money to buy a ticket”. Well, if you have the money, buy a ticket and go see it. Certainly worth a watch. And we are live in 3 . . . 2 . . . 1 . . .